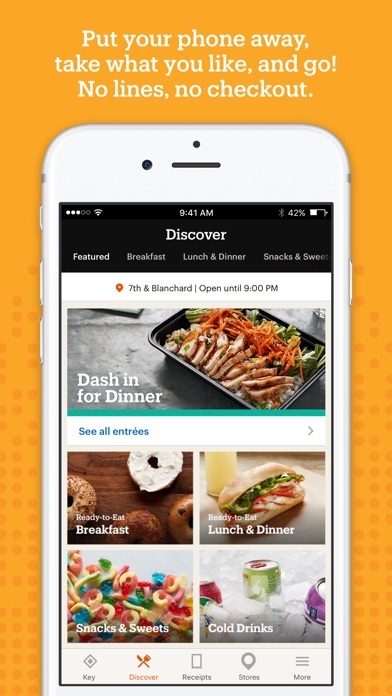 Get the Amazon Go app to shop at Amazon Go, a new kind of store featuring Just Walk Out Shopping. 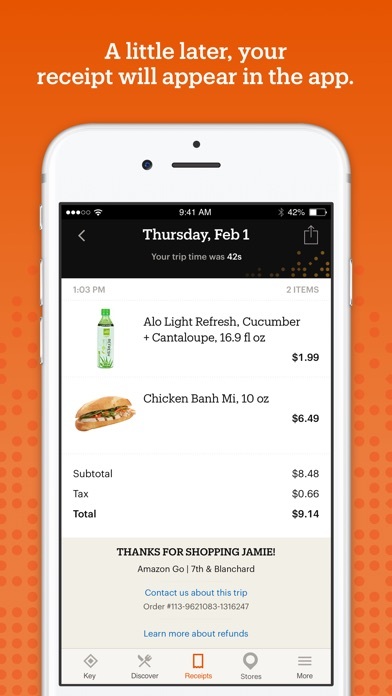 No lines, no checkout—just grab and go! 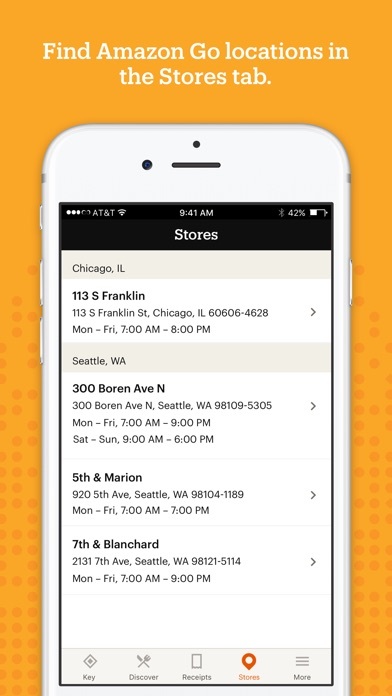 How it Works: • Download the Amazon Go app and sign in before you visit the store. 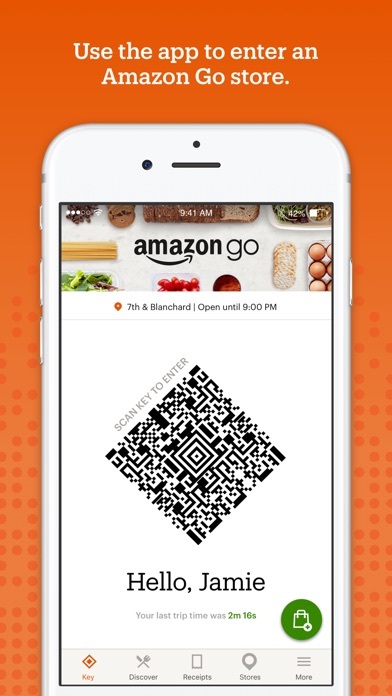 Use the app to enter, then shop and browse as you normally would. • When you’re done shopping, you can just leave the store. A little later, we’ll send you a receipt and charge your Amazon account. What We Sell: • We offer delicious ready-to-eat breakfast, lunch, dinner, and snack options made by our chefs and favorite local kitchens and bakeries. • For a quick home-cooked dinner, pick up one of our chef-designed Amazon Meal Kits, with all the ingredients you need to make a meal for two in about 30 minutes. Need and Apple Watch app and this would be a seamless experience. Please make an Apple Watch app for mobility too. A simple and speedy experience. I like the products in the Chicago Ogilvy location. Zip in, zip out, take dinner home with me. Not much that I would improve. We went to a Seattle location purely for the experience. We downloaded the app, found a location to go to through the app. It works great!!! I walked in, picked up a sandwich and walkout. It was that easy. The sandwich was great and fresh. They had Ellenos Yogurt!! Had a great experience at the Chicago store. The greeter by the entrance of the store was very helpful. 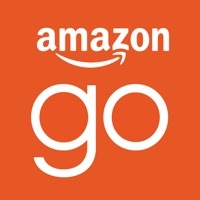 Tried the go store in Seattle and while the experience was absolutely seamless inspite of purposeful attempts to find faults with the system, the only complain is that there’s no way for me to see what my total cost is. The store was pretty small so I bought only a few items and managed to do some mental math but that might not be an option for a lot of people and a definite blocker if this technology were to scale to a store the size of Whole Foods!